Pete Hanshaw: Do you want to play a game? My Chrome browser split in half last night and asked me if I wanted to play a game. Saying yes turned my browser into a pseudo python console. Apparently Google has been tracking my search history and seen that, yeah, I like Python. Ok, having the browser window suddenly split open because someone is watching your search history is vaguely creepy, but what the hey, I do like Python! Why do they want to play a game with me? I don't know, its Google. Why did they make Google maps into Pac Man? Its Google. They do stuff like that. The first challenge was to take an equation as a string and parse it into reverse polish notation. After thinking about it today I was able to write a passable parser that will probably make any real mathematician twitch- but it works and the code doesn't make me twitch. The challenge was, well, challenging, but fun! It reminds me a bit of the Project Euler challenges, except this one gives you a hopping bunny when you succeed. 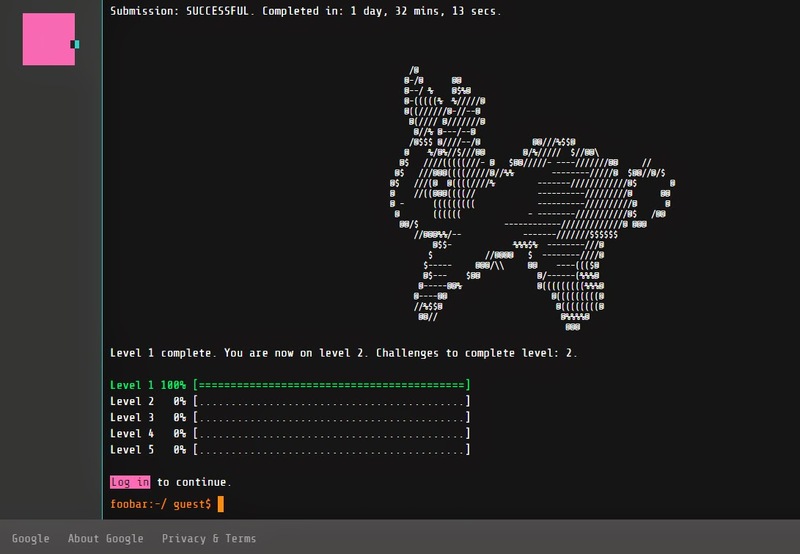 An animated ASCII hopping bunny. Hop little bunny. Hop for joy!